Many people call the Cycad a palm, but it's not, it only has a similar shape. In fact the whole group is very old-fashioned, they're somewhere in the middle between ferns and Seed Plants, closer to conifers than palms. Dinosaurs walked around some species, maybe the ones we still see. To me it is always a spiritual thing to come across them, and I enjoyed at least two, maybe more species in the wild of Australia. Even though this one was found in Territory Wildlife Park, I could not find a mark telling the species. 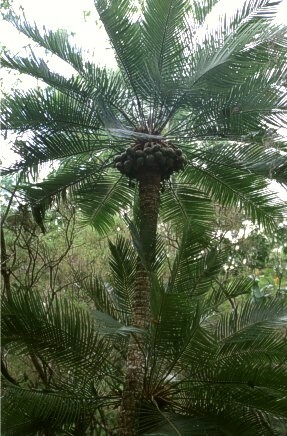 For your information this is the Cycad circinalis with a lot of seeds hanging around. From the size of the tree it seems to be at least 20-25 years of age.